Directions:From Meyers at junction of Highways 50-89, take Hwy 89 South and go 11 miles to junction of Highways 88-89. Turn East and go 6 miles to Woodfords. Turn South and go 12 miles on Hwy 89 (past Markleeville) to junction with Hwy 4. Continue straight on Hey 4 for 13 miles. Reservoir alongside highway. Steep, narrown winding road last several miles. Limited parking Trail access to Lower and Upper Kinney from here. This area is a real treasure in that a number of trout species can be caught within a relatively small area. 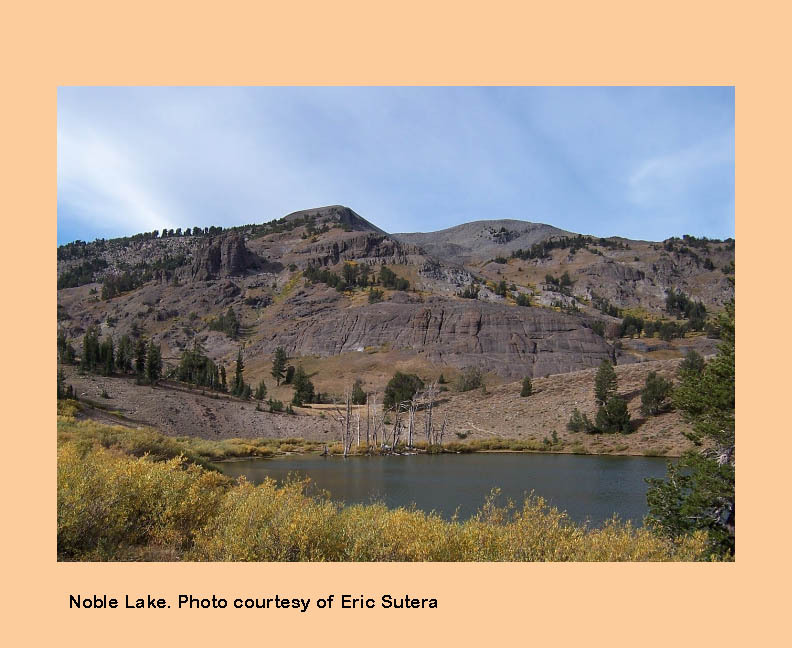 Within a 8 mile hike from either side of Highway 4 at Kinney Reservoir, you have an opportunity to catch: Rainbows, Lahonton x Rainbow Hybrids, Paiute Cutthroats, Brookies, and Goldens. 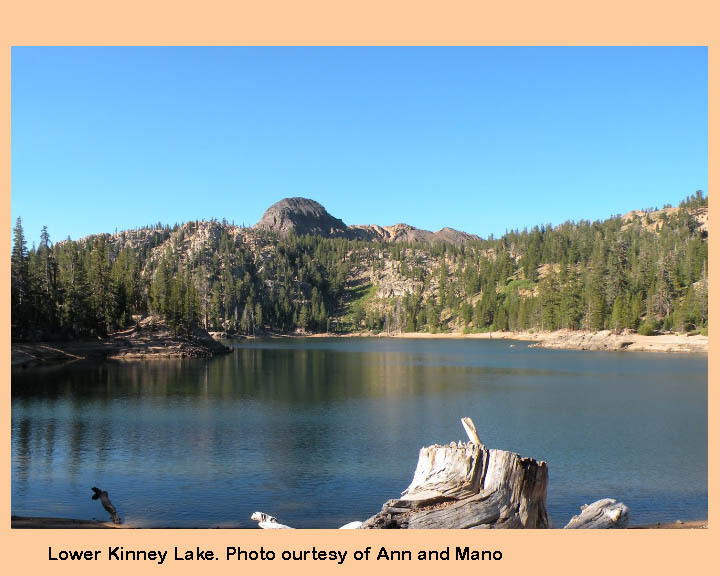 Kenney Reservoir, as well as, the Upper and Lower Kinney Lakes were created during the late 1890's by a group of farmers who farmed downstream along the EF Carson River. They dammed a tributary of Silver Creek to form the lakes and constructed a concrete dam on Lower Kinney in 1926. The dam on Upper Kinney was completed in 1990. (33 acres) at 8,353 feet elevation. The Reservoir is planted with Rainbows and Brookies	, size 9-11 inches. The Reservoir can be fished by float tube and is often fished from shoreline by bait fishermen with easy access from Highway 4. 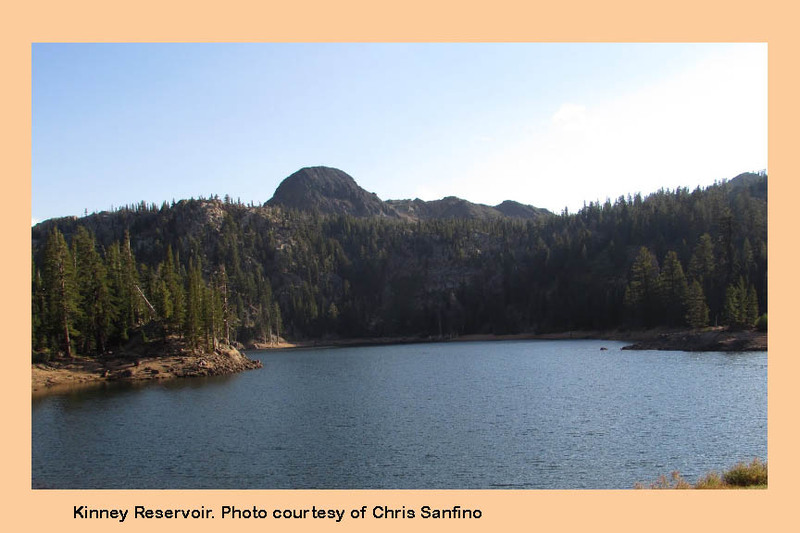 The reservoir is drawn down heavily through the summer, so CDFW plants only about 2,000 trout in the early summer..
Lower Kinney is 495 acres at 8500' and Upper Kinney is 320 acres at 8700'. Both are best fished from a float tube. 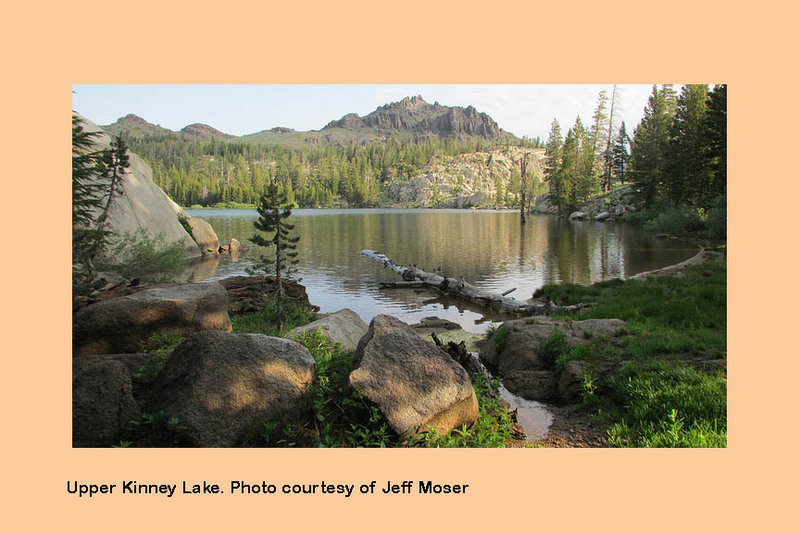 Upper and Lower Kinney lakes are stocked with Lahontan X Rainbow hybrids. Most of the fish are in the 10-15 inch range although there have been some 20 inch lunkers reportedly caught as well. 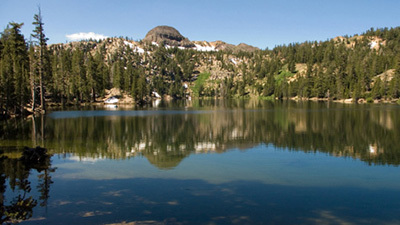 The lakes are a short one mile hike from Kinney Reservoir. Camp sites are available, particularly around Upper Kinney on the western side. Midges and emergers are popular particularly during low light conditions. Streamers will also provide good action using a Type III sinking line to get down to 4-8 feet. During midday, fishing can be difficult due to high winds. 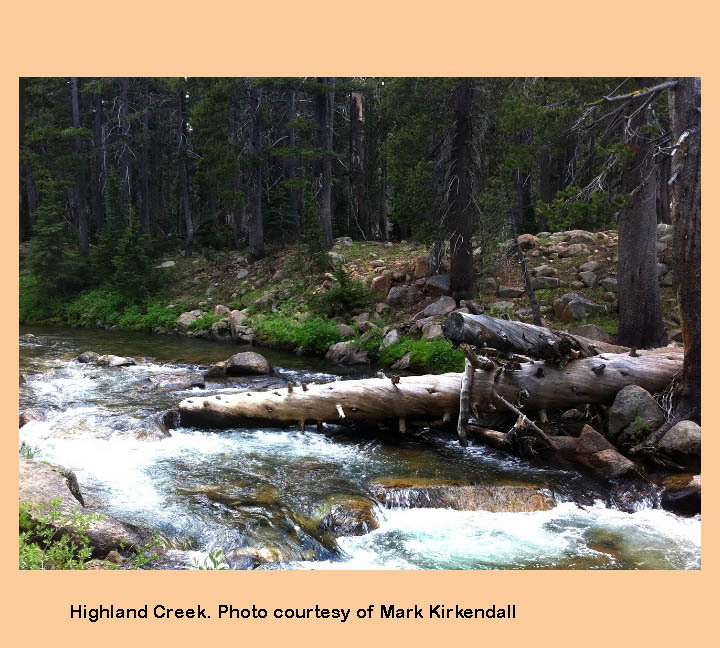 Following the inlet creek to Sherrold Lake near Upper Kinney, you can reach small Dorothy Lake. Dorothy Lake reportedly has Goldens and Lahonton x Rainbow hybrids. 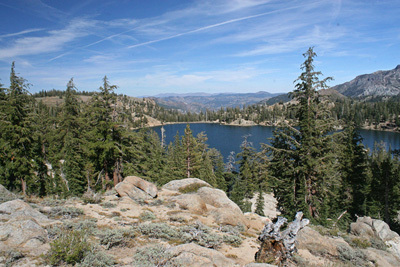 Hiking to the south of Kinney Reservoir is Noble Lake, about 4 miles distant on the Pacific Crest Trail. Noble contains large brook trout up to 2.5 lbs. Terrestrials such as hoppers work well as do attractor nymphs such as copper johns. Hiking another 4 miles south is Bull Lake which contains Paiute cutthroats. Hiking to the north of Upper Kinney Lake is Raymond Lake, about three miles distant on the Pacific Crest Trail Raymond contains Goldens. 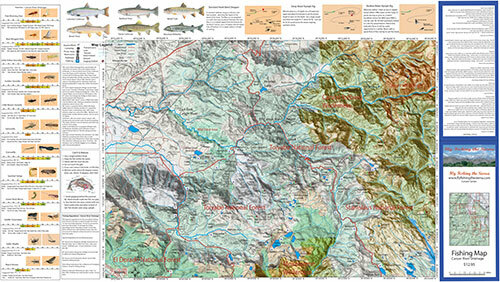 Covers the watershed areas of the Carson River within the Sierra. Shows topographic relief, GPS Long./Lat., camping areas, road access, and Trailheads. Special Features are Suggested Flies, Nymphing Rigs, Fishing Season and Regulations, Fish Identification, Catch & Release Procedures, and Stream Etiquette guidelines. Printed on Rite-in-the-Rain Paper that will allow you to write those special notes. Waterproof and Durable.